The main raw materials for infant formula recipe formulation are selected for compositional, cost, microbiological and functional / marketing benefits. There are also variants of infant formula milk with Goats Milk Infant formula recently being formally approved by the EU as a suitable source of protein on 28th February 2012. Camel Milk Infant Formula Milk is a recent new addition to available furmulae and is beiung manufactured in the UAE. Sheeps milk Infant Formula is approved for China. Cow and Goat Milk infant formula are approved for use in the EU, Canada and the USA. Infant formula products are being developed using the milk of other animals and adding value to niche manufacturers. Milk from other sources will take time for approvals to be obtained. The regulations for baby milk vary from country to country so great care needs to be taken when making a formulation to ensure that it fits within the legislation for as many countries as possible. e.g. Iron % may vary within an upper and lower limit and it would be normal to fit the actual infant formula iron content in the middle of the range to allow +/- 5% tolerance and still relmain within specification. If the legislation for three or four different countries needs to be adhered to the the target Iron % will need to fit comfortably within the tolerance range of +/- 5%. Milk & or milk powders - The milk must be from a known source of quality milk with a pattern established for the level of nutrients Protein, fat, lactose etc and also very impotantly micronutrients e.g. Vitamins and minerals and contaminants. There are numerous infant formula variations on equipment and infant formula recipes used but principally there are three main production methods. Recent years have seen an increased number of infant formula manufacturers and in particular companies that prepare Dry Blended Baby Powders for retail sale and the processes are described briefly below. Wet mix or integral process. This is the safest infant formula milk powder process from a microbiological risk viewpoint. Dry blending or base and premix process. Relatively new product which is also a safer process then dry blending baby milk powder process. This is the most secure method of infant formula production from a microbial viewpoint. All infant formula raw materials on receipt at the infant formula plant are reconstituted, heat treated and spray dried. The infant formula wet mix process (integral process) is a more secure process from a microbiological viewpoint as all raw materials are high temperature heat treated as an integral part of the process. The quality of raw materials used for infant formula production are critical. An infant formula base milk powder is used for reasons of optimising plant operational times as a broad base powder containing 90% of the required materials for several formulations is produced, This base can then be blended with the vitamins and minerals whcih will differentiate the recipes betweem Stage,1 Stage 2 etc. Wet mix processing is used for the manufacture of infant formula base powders and integral powders. The Infant formula Raw Milk supply composition varies from breed of cow, to breed of animal to typer of feed and season of the year together with levls of good health and hygienic proactices during milking. Infant formula baby milk production has maximum and minimum legal limits and this requires very details calculation taking into account the total nutrients including micronutrients. Importantly equipment for processing can have different heat treatment profiles making it essential that when the first product is produced then it is tested for e.g. loss of vitamins and the recipe adjusted accordingly to account for any e.g. vitamin C loss by adding vitamin C to the formulation. Dry blending – A combined process involving a base powder manufacture and vitamin and mineral premix. Dry blending of Infant Formula Milk Powder requires a very high microbial quality and security of consistent adherence of the supplier to the specification agreed as no further processing will eliminate the risk which identifies the supplied dry ingredients as a critical supply. This process requires increased auditing and testing compared to the integral process due to numerous suppliers of raw materials. 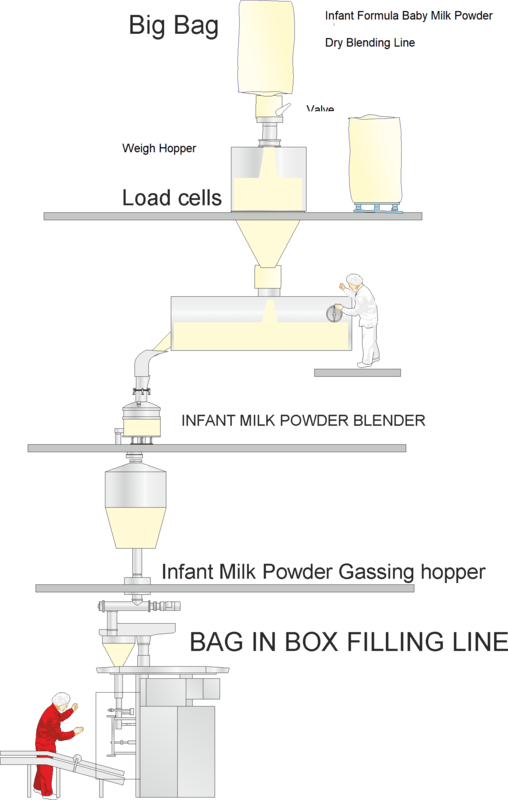 This is a higher risk method for Infant Formula Milk Powder Manufacturers as some of the imported base powders or pre-mixes are not pasteurized on receipt but directly blended giving rise to risk in blending evenly and also it is accepted best practice in food manufacturing that all materials arriving on site are heat treated. There are benefits associated with both methods from a product quality point of view i.e. dry bending allows some of the highly oxidative minerals to be added at the dry blend stage potentially increasing the shelf life of the product and enhancing the flavour profile whilst at the same time giving exonomies of base powder manufacturing. Macro ingredients for dry blended baby milk powder such as Skimmed Milk Powder (SMP) and Lactose are usually of a higher microbial quality (and price) as they are blended without further processing. Infant Formula Dy Blending Equipment. Infant Formula Dry Blender selection is critical. The blender must be a proven unit giving an accurate blend within a specified time. Dry Blenders of Baby Milk Powder should establish a robust protocol for testing the homogenuity achieved by your selected dry blender using set times and speeds for a specified volume. Changing a single raw material can affect the homogenuity of your blend so every time a process change or ingredient supplier / product is changed then the protocl for testing should be re-run to ensure that your infant formula recipies are consistently within specification. The cost of testing is rapidly reducing and as the costs reduce then authorities will carry out more frequent tests so it is critical that your proceduures are very robust. The blender should be in a high risk infant formula standards area and the equipment dry cleaned again using a robust procedure. We cleaning is usually carrried out once every few months if required. Several tests from one batch must be tested and the norm infant formula dry blending is that the Coefficient of Variation (CoV) should be ≤ 5%, and all individual results should be within 10% (absolute) of the mean of the results. Capability index Ci provides information on what the process can deliver compared to the specification The capability index Ci gives information on what the actual ability of the process average is compared to the tolerance limits. The manufacturer of the blender should be able to provide you with this data and a process guarantee on the infant formula blender Test for all parameters with legal limits when establishing the validation but then indicator validations should suffice by testing for example for Vitamin C. The product should at all times during handling be protected from oxidation by keeping it in an inert atmosphere. There are options for dry blending equipment for baby milk powders which will dictate the height of the factory buildings. 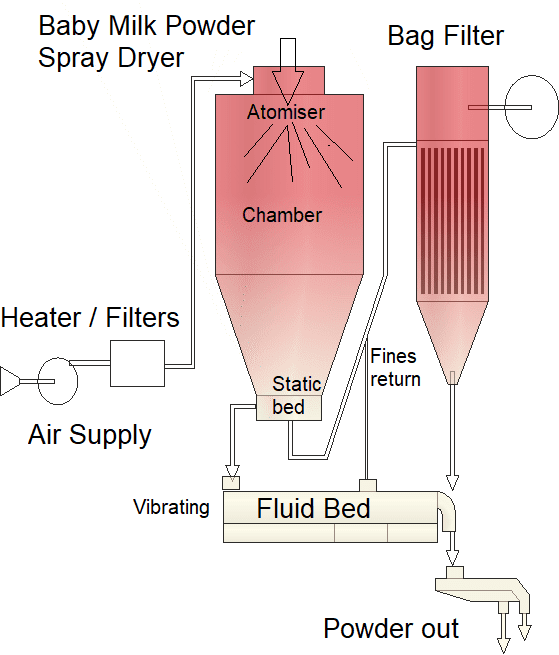 The example below is of a Dry Blending plant configured for a vertical infant formula big bag emptying plant. The vertical option is a gentler process as the agglomerated Baby Milk Powder is gravity fed to the hoppers and filling machines. The otehr option is to place all the equipment at ground level and use spiraflow type conveyors or blowers to transport powwder from one step in the infant formula dry blending packing process to the next step. This additional handling will result in some damage to the agglomerated infant formula milk powders. The agglomeration is important as it makes the powder instant soluble particularly when treated with Lecithin. For more information on the Lecithination Process for Milk Powders then please contact us. A more costly method but also more convenient and secure. In general, ready to feed formula, is more secure microbially, does not require addition of water which may be contaminated, have high levels of nitrate, lead etc which may be the case in some countries and it is also more convenient but is more expensive. Mostly used for premature and sick / vulnerable infants, with increasing use for convenience / travel as prices reduce with volume Liquid "Ready to Feed" Infant Formula manufacturing increasing. The selection, treatment and handling of vegetable oils for use in Infant Formula is critical and it is imperative that a very robust supplier risk assessment and supplier audit system is in place for category 1 suppliers. Supply chain development and control procedures must be implemented prior to manufacturing commencing. For more information or to discuss your requirements please contact us. Note: All information on this website is for interest only and not to be relied upon. We are a longstanding member of the Society of Dairy Technology and have Fellowship of the Institute of Food Science and Technology.